It was about eight years ago, I was working in a Datacenter in Scotland and customer was using ESX to run their infrastructure. I got an initial insight into VMotion and once I saw that I was hooked. I started working more and more with VMware, when I got to Australia in web companies, large financial organisations and now the main telco. Working with VMware has given me a chance to work across all areas of infrastructure and with a large number of applications and has really expanded my architecture skills. I actually met Frank Fan in one of my roles and three of us talked about his experience and we decided we should go ahead and do the VCAP exams and then try for VCDX, if the right project came up. Harsha Hosur and I successfully defended last July. I had updated to VCP 5 in 2012, so it took a couple of years, mind you my second son was born and I put things on hold for a while, so in the end I was successful in just over two years, sitting (my second) panel defence in July 2014. Be prepared to be patient, it is a long term project. Also make sure you get your family to understand how hard you will have to work, on top of your job, I talk about this in my youtube video. Above all get advice from good people, I was lucky enough to have Josh Odgers as my mentor. I would have not sat the first defence, I was not ready, although it did give me good insight into what it is like, I should have listened to my instinct and waited. I would also definitely have had more practice presenting. Ironically I now present multiple times a week as part of my new role, and if you are not used to it, it will definitely affect your nerves! Actually the response was pretty amazing, I am the only VCDX in the company, my managers were really responsive and I feel it has really helped. 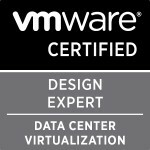 I also spend a lot of time working with VMware and it always helps to have a VCDX in the conversation. Categories: Certifications, VCDX, VMware | Tags: VCDX, VCDX Spotlight, Virtualisation, virtualization, VMware | Permalink.